After a big showing at the BIG IDEAS for UV+EB Technology Conference in California in mid-March, where is RadTech going next? The RadTech Transportation Committee is sponsoring a half-day of presentations on April 11, “UV/EB Leading the Way for the Future of Automotive,” plus the first RadTech exhibit booth at SAE. RadTech is sponsoring an Intro to Radiation Curing short course. The two-day educational forum offers introductory and advanced sessions led by top coatings specialists. Early bird pricing ends April 1. RadTech is sponsoring a presentation and tabletop exhibit. 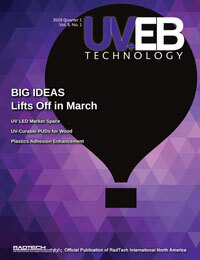 RadTech is sponsoring presentations with distribution of UV+EB Technology magazine. In the next week or so, a call for papers for the 2020 RadTech UV+EB Technology Expo and Conference will be sent out. The event has been scheduled for March 9-11, 2020, at the Disney Coronado Springs Resort in Orlando, Florida. Details will be available at http://www.radtech2020.com.